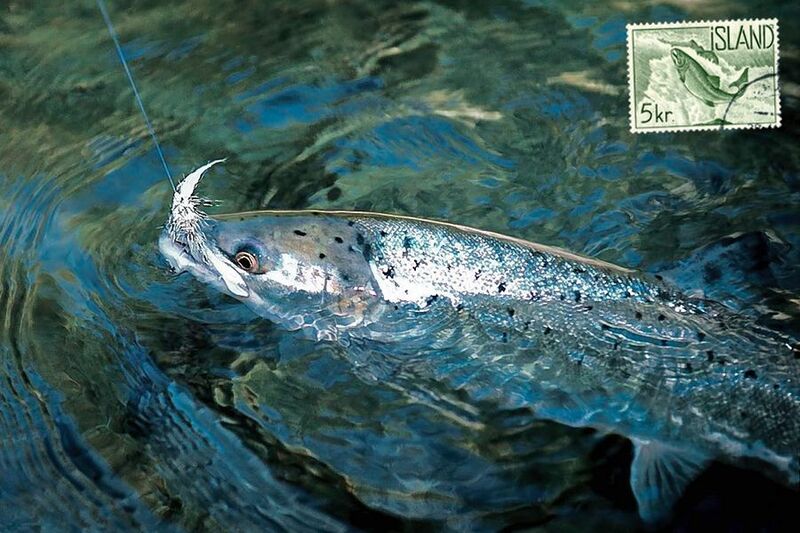 On the Fishmadman site, we will try to highlight the essences of surface fly fishing. We hope to do so by showing you technique, know-how and some of the many fascinating flies made for our sport. 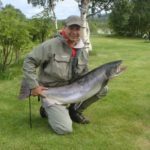 During summer we stay at salmon rivers in Norway – and when the conditions are right we will tie on a dry fly like a salmon Bomber. On our pages, you will find Bombers literally cut into shape at the river bank. something completely different – with abilities that go beyond any fly you have tried… tap into our vast knowledge base on tube fly know-how – and get another Ace on your hand. 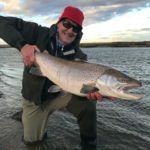 Passion & curiosity for flies and fishing is what determines our editorial line on Fishmadman – and we have collected some of the most interesting flies on our page: Flies like General Practitioner, Brooks Sunray Shadow, Collie Dog, The Frances Fly, and a Micro Conehead fly like the Kinnaber Killer. What do salmon eat in the sea? Write us if you have something that you would like to share with our readers or you want us to look into a aspect of our sport. Here is a picture of a Sea Run caught on one of the Sun-Rays you sent me for my trip to Despedida Lodge in Tierra del Fuego Argentina a few weeks ago.—Fish were actually eating small Skuds (14 & 16’s), but this fish was hungry, and couldn’t resist an appetizing smaller Sun-Ray. I’m looking forward to working with you & Per on some larger Tubes and Partridge doubles for the higher water conditions we might face in late June?—NOT my preferred conditions for smaller and lighter lines and flys, but at least I’ll be prepared.—Thanks. These sea-run brown trout are most often caught with a small nymph, a scud pattern in size 14 or even 16 (try landing a 20 pounder on a size 16 nymph hook!). But they will also come to swung flies (like Collie Dogs or Sunray Shadows) or even skaters. The guides thought your Fish Madman Flashback Bug reflective foam-backed skater (which I know from personal experience is just a killer pattern for steelhead in B.C.) was too big, but I gave her a go and pulled up two nice fish from the depths! Next time I go down to the Rio Grande I will start every morning (it’s calmer in the morning, by noon it’s blowing 30 miles/hour or more) by gently skating one of your flies across the run before ripping it up with sink tips. I’d also try some of your smaller hitch flies as well and I’m going to try all the above on steelhead next summer and fall in BC. 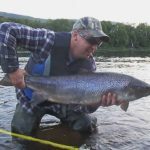 Hi Jesper & Per Here is a photo of a 40 inch by 21 inch Atlantic salmon we landed on one of your Monster caddis tube flies the last week. You can see the fly hanging from the fish’s mouth (barely). 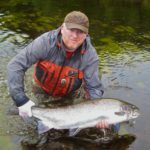 I’ve hunted large salmon for 20 years throughout Newfoundland and Labrador and that fly moves them unlike any other. We’ve had many large fish come to that fly in the last week when other flies just would not move them. The quality of workmanship and materials used in creating a musical instrument will have a limiting effect on a musicians preforming potential. I feel the same about the equipment and flies I use when trying to make a receptive audience of the stubbornly critical Atlantic salmon. The tubed dry flies I received from Fishmadman allow me to play the fly just as I want. I treat them meticulously with silicone throughout the winter and again the night before a day fishing. These flies float higher on the waters surface than any others I've seen. I can lay them down ever so naturally, even with a long line in heavy wind. Their tubed fly is as responsive as electronic power steering when mending your line for the perfect presentation and control. I made a trip to one of my favourite pools in the spring of last year. The winds were high, the rain streaming, and you could see your every breath. Higher than normal water levels intensified the whirl pool like currents that makes this a wet fly kind of place for most anglers. I fixed a tubed orange and grey bomber to my 10lb tippet as my first choice of the day. As I mentioned, the winds were high, "hold onto your hat" high. The type of wind that requires strong and low cast, timed between the strongest gales, if you are to have any control of where and how your fly is going to land. I only made about a dozen cast before I got an encouraging rise. The fish came straight up with its mouth wide open and just missed the fly before disappearing back into the cold fresh water. 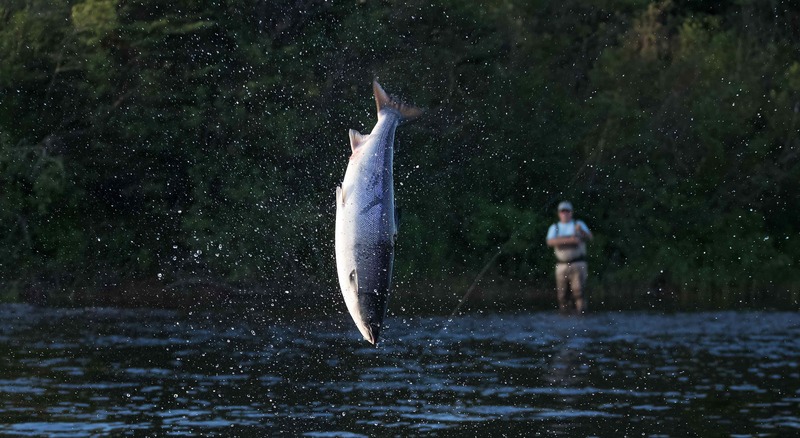 The trick to getting that fish to "take" is to make sure you duplicate your last cast. It's in these kinds of fishing conditions that quality equipment and flies can really compliment the anglers skill. After a short spell, I timed the gusts of wind as best I could and whipped the fly ahead of the fish, leaving mending room to represent the last presentation. This time the salmon gobbled the fly like a dog catching a frizbie. She measured in just over 35 inches of chunky prehistoric silver. There is no doubt in my mind that the tubed bomber from Fishmadman was an essential part of the formula making that dream come true. 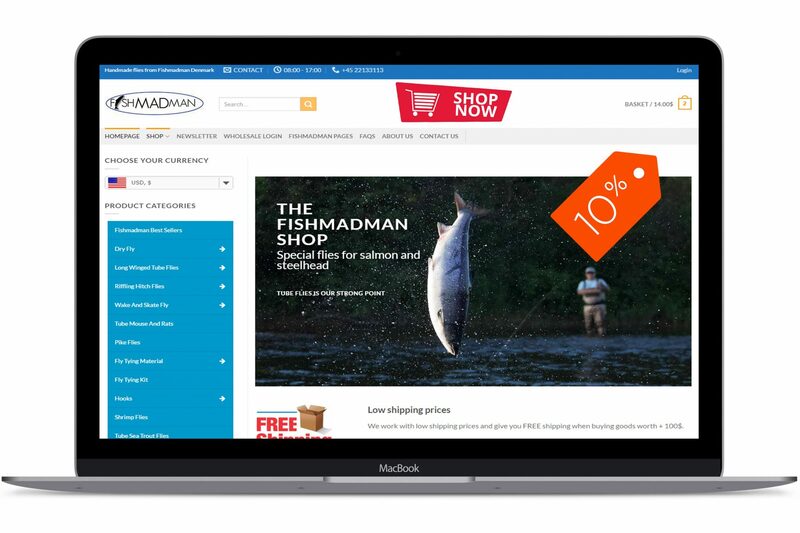 I'm convinced that the workmanship and materials behind Fishmadman's tubed dry flies have indispensably helped me warm up many tough crowds of cold critical Atlantic salmon. I can tell you this fly and other tube dry flies will definitely be in my arsenal from this point on! 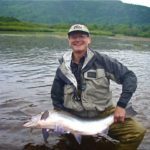 Several times I hooked and landed large Atlantic salmon on their creations when my traditional flies and Bombers had no effect on the salmon. 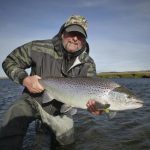 The Atlantic Salmon world is continually changing with new gear and techniques, Don’t miss the boat on this new and exciting way to fish dry flies! 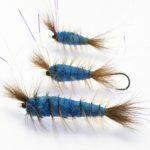 Give these flies a try! You’ll be more than happy that you took the time!! 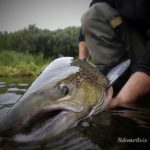 Thank-you Jesper and Per” Tight Lines! © Copyright Fishmadman 2019 - All Rights Reserved.